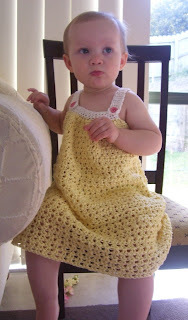 I recently made this new dress for Holland. It is a yoke-style dress...you could call it a sun dress, but it'd be great any time of the year with a little top under it or a sweater over it. It will be spring here soon in New Zealand and Holland will definitely get lots of use out of this new dress. I love the sunny yellow color on her too.